These differences cannot be detected with conventional large target FISH probes or with labeled pools of oligos. Only Cytognomix`s ab initio scFISH probes are capable of visualizing differential accessibility in metaphase chromosomes. Cytognomix has released a new version, V2.0, of the Shannon pipeline for mRNA splicing mutation analysis. It is distributed by CLC bio for use with their Genomics workbench or server. Click here to download the updated documentation. For laboratories that do not use CLC bio software, we have developed standalone version of the software which is available for custom integration into your existing NGS software analysis pipeline. It does not require any CLC bio products, but produces the same results as those products. Please contact Cytognomix if your are interested in this capability. Non-random, locus-specific differences in DNA accessibility are present in homologous metaphase chromosomes. W. A. Khan1,3, P. K. Rogan2,3,4, J. H. M. Knoll1,3,4 1) Department of Pathology; 2) Departments of Biochemistry and Computer Science; 3) University of Western Ontario, London, Ontario, Canada; 4) Cytognomix, London, Ontario, Canada. Condensation differences between heterochromatin and euchromatin along the lengths of homologous, mitotic metaphase chromosomes are well known. This study describes differences in metaphase compaction between homologous euchromatic loci. We report molecular cytogenetic data showing local differences in condensation between homologs that are related to differences in accessibility (DA) of associated DNA probe targets. Reproducible DA was observed at ~10% of 450 distinct genomic regions mapped by single copy fluorescence in situ hybridization (scFISH). Fourteen short (1.5-5kb) sc and low copy (lc) FISH probes (from chromosomes 1, 5, 9, 11, 15, 16, 17, 22) targeting genic and non-genic regions with and without DA were developed and hybridized to cells from 10 individuals with cytogenetically-distinguishable homologs. Differences in hybridization were non-random for 6 genomic regions (RGS7, CACNAB1, HERC2, PMP22:IVS3, ADORA2B:IVS1, ACR) and were significantly-biased towards the same homolog (p< 0.01; n = 355 cells). The imprinted paternal chromosome 15 in a three-generation pedigree also showed non-random bias in DA. DNA probes within CCNB1, C9orf66, ADORA2B:Ex 1-IVS1, PMP22:IVS4-Ex 5, and a nongenic region within 1p36.3 did not show DA, while OPCML showed unbiased DA. A subset of probes was mapped onto chromosome topography by FISH-correlated atomic force microscopy (AFM). To quantify DA and pinpoint probe locations, we performed 3D-structured illumination super-resolution microscopy (3D-SIM). 3D anaglyph videos showed genomic regions with DA having nearly 5-fold larger differences in volumetric integrated probe intensities between homologs. Additional non-DA probes (NOMO1, NOMO3) hybridized to grooves in chromosome topography and exhibited a narrow range of probe depths (average: 0.08 μm) along axial and lateral axes of the 2 homologs. In contrast, probe for targets with DA (HERC2, PMP22:IVS3, ACR) significantly differed in probe depth (average: 0.77 μm) and volume (p < 0.05) between each homolog. Interestingly, genomic regions without DA are enriched in epigenetic marks (DHS, H3K27Ac, H3K4me1) of accessible interphase chromatin to a greater extent than regions with DA, suggesting these differences may be correlated with epigenetic marks established during the previous interphase. In summary, we present several lines of evidence that regional differences in condensation between homologs are programmed during metaphase chromosome compaction. Click here for presentation details: session, location, time. Citation: Ellard S, Patrinos GP, and Oetting WS, Clinical Applications of Next-Generation Sequencing: The 2013 Human Genome Variation Society Scientiﬁc Meeting, Human Mutation, DOI: 10.1002/humu.22400, 2013. Available online: Human Mutation, in press. Session 27: Causes and Consequences of Chromosomal Variations. Title: Non-random, locus-specific differences in DNA accessibility are present in homologous metaphase chromosomes. Authors: Wahab Khan, Peter Rogan, and Joan Knoll. This study examines locus specific DNA accessibility during metaphase using Cytognomix’s single copy FISH probes imaged by superresolution microscopy. Cytognomix has been invited to present applications of our ab initio sc probe targeted capture array technology and the Shannon software pipeline this fall at several venues in Italy. Invited presentation: “Deciphering variants of unknown significance in inherited breast cancer genes and exomes,” to the Clinical Cancer Genetics group of the Italian Society of Human Genetics (18th Incontro di Genetica Oncologica Clinica, SIGU), that will be held at the Policlinico S. Orsola in Bologna, Italy on July 19 2013 at 11 AM. We will describe predicted splicing, UTR and transcription factor binding site mutations, confirmed by RNASeq transcriptome data, and pathway analysis of the genes containing these mutations. We have released a new version (1.0.5) of the Shannon splicing mutation pipeline. The new version now processes large sets of variants (ie. from multiple complete genomes) more quickly, and now includes the ability to import variants using CLC bio’s variant track format (in addition to VCF). Documentation has been significantly improved and several sets of example data are provided with the software release. The documentation contains additional screenshots of the expected input and output, and now includes a page providing tips on how to filter the output using CLC bio’s built in functionality. TORONTO, ON, April 29, 2013 – Ontario Genomics Institute (OGI) congratulates Cytognomix on the success of the Shannon Human Splicing Pipeline, which was recently purchased by the National Cancer Institute (NCI) in the U.S. In 2009, OGI invested in Cytognomix through its Pre-commercialization Business Development Fund (PBDF). Understanding the wealth of data generated by next-generation sequencing is essential to determining which mutations are clinically significant. Cytognomix’s Shannon pipeline assesses the millions of variants of unknown significance detected in cancer genetic testing by predicting mRNA splicing abnormalities. This technology improves accuracy and ease of data interpretation, saving time and reducing mistakes. OGI’s PBDF program has invested in opportunities — based in genomics, proteomics or associated technologies — that fall in the proof-of-principle (validation) phase of research and that have the short-term potential to secure a significant next step towards the marketplace. Previous recipients have included Ontario universities, research institutes and companies. The Ontario Genomics Institute (OGI) is a private, not-for-profit corporation focused on driving the life sciences industry in Ontario through the use of genomics to increase the quality of life of all Ontarians through better health outcomes, a healthier environment and sustainable agriculture. OGI’s portfolio contains nearly 100 genomics research projects and companies, with total research investment exceeding $800 million and attracting more than $40 million in venture capital. This work is enabled through relationships with Genome Canada, the Government of Ontario through the Ministry of Research and Innovation, and the Ministry of Economic Development, Trade and Employment, and other private and public sector partners. For more information, please visitwww.ontariogenomics.ca. Since 2009, Cytognomix (http://www.cytognomix.com) has been developing and marketing software-based solutions and reagents for clinical genomics from London, Ontario, Canada. Our intellectual property portfolio emphasizes clinical and research diagnostic applications. Products include software for mutation analysis, DNA probe reagents, and companion software to detect chromosome abnormalities. Our Shannon pipeline line of software products is unique in the industry in its ability to accurately predict functionally-significant, non-coding variants in complete genome or exome sequences. Genome-wide DNA probe sets have been designed using our patentedabinitio_probesTM. Beginning with sales of scFISH probes, we have since designed and produced genomic microarrays and manufactured solution capture arrays for targeted sequence enrichment. All of our products are described in highly cited, peer reviewed publications. Contact us atinfo@cytognomix.com for more details. The IFOM-IEO Campus is a new biomedical research centre, created by the joint efforts of the FIRC Institute of Molecular Oncology Foundation (IFOM) and the Department of Experimental Oncology of the European Institute of Oncology (IEO), which have expanded and integrated their research activities on a common campus. The IFOM-IEO Campus is located in Milan, the heart of the commercial/industrial north of Italy, where it benefits from numerous interactions with other scientific and medical organizations in the area (see participants below). The Campus is also home to the Ph.D programs of the European School of Molecular Medicine (SEMM), which it is running in collaboration with the University of Milan, the University of Naples “Federico II” and the Italian Institute of Technology (IIT) in Genoa. Research in the field of cancer to better understand the biological mechanisms and systems to continuously improve diagnosis and treatment. The diagnosis and treatment of cancer, with the methods that are recognized internationally as the most valid. The oncology information of citizens and the training of medical and nursing staff involved in the treatment of cancer. Host: Dr. Paolo Radice – S.C. Medicina Predittiva: basi molecolari del rischio genetico e TestGenetici, Dipartimento di Medicina Predittiva e per la Prevenzione. Ben Shirley, Chief Software Architect of the Shannon pipeline for human mRNA splicing mutation analysis presented a webinar today including a live demonstration of the software’s capabilities. We received a number of favorable comments on this LinkedIn Network Discussion. The presentation was recorded and will be available in the future for viewing. Please bookmark this webpage. We will share the URL of the recorded presentation when it becomes available. Peter Rogan is giving a platform presentation on: “Genome-wide prediction and validation of mRNA splicing mutations in cancer” at the HGVS meeting in Paris, France on June 8, 2013. The meeting will be held at the Hotel’Concorde’La’Fayette, just preceding the annual European Society of Human Genetics conference, at which Dr. Rogan will also be presenting a paper. The presentation will be led by Ben Shirley, the chief developer of the Shannon Human Splicing Pipeline. The webinar will be appropriate for all levels of researchers interested in using the software to reduce a genome-scale list of splicing variants to a tractable set of potentially deleterious mutations, suitable for further analysis in the laboratory. On the day of the webinar, you will be able to access the webinar by clicking here and entering as a guest. STRATEGY FOR IDENTIFICATION, PREDICTION, AND PRIORITIZATION OF NON-CODING VARIANTS OF UNCERTAIN SIGNIFICANCE IN HERITABLE BREAST CANCER. Objectives: Non-coding sequence variants have been proven to significantly contribute to the phenotypes of high penetrance disorders. We develop an approach to predict pathogenic non-coding variants of uncertain significance(VUS) based on information theory-based analysis of changes in DNA and RNA sequences bound by regulatory factors. Methods: Complete gene sequences are captured, enriching for non-coding variants in genes known to harbor mutations that increase breast cancer risk. Oligo baits covering the complete coding and intergenic regions 10kb up- and downstream of ATM, BRCA1, BRCA2, CDH1, CHEK2, PALB2 and TP53 were used in solution hybridization. Probe design captures both repeat-free and divergent repeat sequences that are effectively single copy. After Illumina sequencing of 21 high risk patient samples lacking coding mutations, information analysis prioritized non-coding variants within sequence elements recognized by proteins or protein complexes. VUS are being screened for mutations affecting essential binding sites recognized in mRNA splicing, by transcription factors (TFBS), and by protein interacting with untranslated regions (UTR). Information models for exon recognition predict the relative abundance of natural, cryptic, and mutant splice isoforms resulting from predicted mutations. A similar approach is introduced to detect mutations that alter strengths of TFBS and UTR binding sites. Information weight matrices were determined by entropy minimization of ENCODE ChIP-seq regions for 60 transcription factors embedded within DNAse I hypersensitive domains. Results: The matrices were used to evaluate novel variants discovered by sequence analysis of breast cancer patients for alteration the TFBS binding strengths. This analysis prioritized 9 splicing, 8 TFBS, and 2 UTR variants as most likely to affect gene expression, potentially affecting 6 protein coding genes in the patient samples (from 7,909 variants in 7 genes). Conclusion: This strategy more comprehensively covers non-coding regions in breast cancer genes than repeat masking, and introduces a unified framework for systematic interpretation of VUS that affect expression. March 26, 2013. New article published on chromosome centromere structure and composition. Khan W.A., Chisholm R., Tadayyon S., Subasinghe A., Norton P., Samarabandu J., Johnston L.J., Knoll J.H., Rogan P.K. Relating Centromeric Topography in Fixed Human Chromosomes to α-Satellite DNA and CENP-B Distribution. 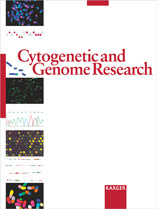 Cytogenetics and Genome Research, 2013 (DOI: 10.1159/000348744). Despite extensive analyses on the centromere and its associated proteins, detailed studies of centromeric DNA structure have provided limited information about its topography in condensed chromatin. We have developed a method with correlative fluorescence light microscopy and atomic force microscopy that investigates the physical and structural organization of α-satellite DNA sequences in the context of its associated protein, CENP-B, on human metaphase chromosome topography. Comparison of centromeric DNA and protein distribution patterns in fixed homologous chromosomes indicates that CENP-B and α-satellite DNA are distributed distinctly from one another and relative to observed centromeric ridge topography. Our approach facilitates correlated studies of multiple chromatin components comprising higher-order structures of human metaphase chromosomes. March 26, 2013. New US Patent issued. US Pat. No.8,407,013 issued: “Ab initio generation of single copy probes”. This patent covers single copy probes that also contain divergent repetitive sequences, which under certain conditions, hybridize like single copy sequences. This expands the human genomic real estate accessible for single copy genomic analysis techniques. Cytognomix has used this approach to produce FISH probes in regions that could not be accessed by repeat masking, genomic microarrays, and capture arrays for next generation sequencing. If you are interested in licensing any of these fields of use, please contact us at info@cytognomix.com. March 15, 2013. Paper describing the Shannon pipeline for human mRNA splicing mutation analysis. Interpretation, Stratification and Evidence for Sequence Variants Affecting mRNA Splicing in Complete Human Genome Sequences. B.C. Shirley, E.J. Mucaki, T. Whitehead, P.I. Costea, P. Akan, P.K. 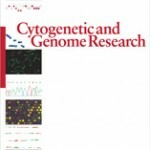 Rogan (2013), Genomics, Proteomics and Bioinformatics. Intensity Integrated Laplacian Based Thickness Measurement for Detecting Human Metaphase Chromosome Centromere Location. Arachchige AS, Samarabandu J, Knoll J, Rogan P.
IEEE Trans Biomed Eng. 2013 Feb 20. Accurate detection of the human metaphase chromosome centromere is an important step in many chromosome analysis and medical diagnosis algorithms. The centromere location can be utilized to derive information such as the chromosome type, polarity assignment etc. Methods available in literature yield unreliable results mainly due to high variability of morphology in metaphase chromosomes and boundary noise present in the image. In this article we have proposed a multi-staged algorithm which includes the use of discrete curve evolution (DCE), gradient vector flow (GVF) active contours, functional approximation of curve segments and support vector machine (SVM) classification. The standard Laplacian thickness measurement algorithm was enhanced to incorporate both contour information as well as intensity information to obtain a more accurate centromere location. In addition to segmentation and width profile measurement, the proposed algorithm can also correct for sister chromatid separation in cell images. The proposed method was observed to be more accurate and statistically significant compared to a centerline based method when tested with 226 human metaphase chromosomes.